Marrying reduced churn, with revenue expansion, and a scalable cost effective acquisition strategy is the surest way for a SaaS startup to drive growth thus justifying its importance. The numbers can also be calculated with or without modifications e.g. if focusing on monthly churn you may chose to remove those clients on annual contracts from your calculations (as they cannot churn). The basic calculation is simply measuring the net change in numbers over a particular period e.g. monthly or annually. See David Skok for key SaaS metric definitions and calculations. Regardless of the approach you take to calculating churn, one thing is clear, ensuring your churn rate is as low as possible is of vital importance to your startups survival. Many startups focus on customer acquisition as a key driver of growth. 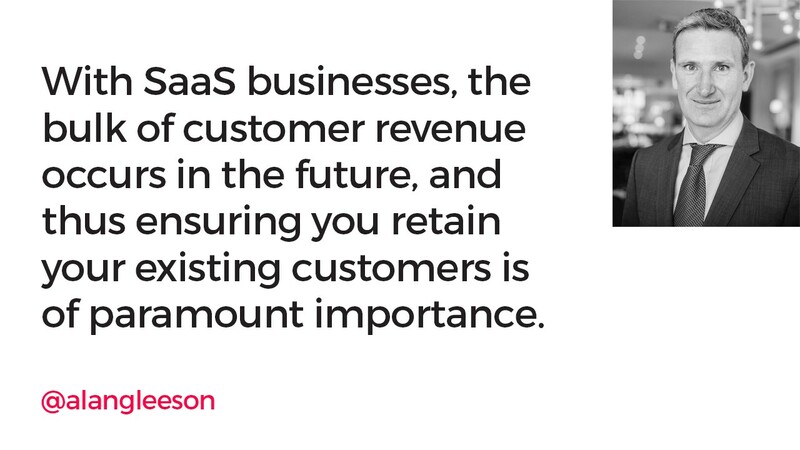 However, with SaaS businesses, the bulk of customer revenue occurs in the future, and thus ensuring you retain your existing customers is of paramount importance. With SaaS businesses the cost of customer acquisition is upfront and in-full, whereas revenue is uncertain resulting in obvious cash-flow implications. Profitability is thus reliant on customers not churning and being retained well into the future. For most startups life is not so simple, and many acquired customers simply do not stick around. Understanding the key drivers of churn and ensuring robust processes are in place to minimise the extent of churn is thus of critical importance. What Does Good Churn Look Like? SaaS businesses are complex, with no two alike, and given the variations in SaaS applications, core business models, customer types and approaches to calculating churn, it is very difficult to benchmark churn rates. Take customer type as an example, if the dominant segment of your user base is SMB’s and entrepreneurs, churn will likely be high due to increased failure rates, compared to larger more established businesses. If your primary customer group is enterprise customers, churn rates will likely be lower due to it being a more considered purchase decision, often consisting of a number of decision makers, with annual contracts the norm, and where switching costs are more likely. Comparing churn in this scenario would be futile. However, whatever your unique circumstances, low single figure annual churn rates need to be the goal. The list of reasons people churn is endless, however, at it’s most base level if you can deliver an exceptional value proposition many of your users are likely to stay. For innovative startups though this is difficult as they are embarking on a journey of discovery. While the ultimate goal will be to offer a compelling solution which delivers significant value it is not that easy for fledgling startups seeking to forge a new path, and thus churn rates can be unsustainably high. So what can startups do in the interim to minimize churn while striving for product/ market fit? Delighting your users by enabling them to be successful with what they are looking to achieve is of course key. For early stage SaaS businesses, feature lite applications, and limited customer engagement can mean that the solution fails to deliver what the customer truly needs. SaaS applications benefit from frequent product release cycles, and thus the development team are in a position to improve the application on an ongoing basis, and to reduce any obvious feature deficiencies. A constant investment in product means that over time the application generates more value for existing customers, and benefits a wider audience than the initial beta version. But this will only occur if developers are engaging with customers first hand, rather than second guessing from behind the comfort of their MacBook Pro’s. Building a strong feedback loop so any initial problems can be quickly rectified will also help ensure that early customers derive real value. Assuming you engage proactively with your initial customers, churn rates should decline over time (when viewed by signup cohort) but this is only after a clear Product-Market fit has been established and the solution is driving real value. Ensuring that early versions of your application deliver real value to a highly targeted niche or persona group helps get your startup off on the right foot. Unless a customer is successful in achieving their goals (with the application) their propensity to churn will remain high. More established SaaS businesses with enterprise clients will typically have a dedicated team whose job is to ensure that new account signups are onboarded successfully, and that the application is delivering value. They will also identify and nurture internal champions, who can facilitate up-selling and cross-selling, leading to negative churn (where expansion revenue outpaces cancellations). For those startups with price points where it is not viable to engage with clients on a one to one basis, the ability for customers to self-serve, and to obtain value without needing to engage with support staff is vital to ensure that razor thin margins are not eroded with support costs. However, in the early days it is important to go above and beyond what would be required in the short term to ensure that your users are benefiting from your solution. Are users onboarding successfully? Are activity levels at the level required to derive value? Are trial users upgrading to paid accounts? However, one man’s meat is another man’s poison, as this perfect storm of customer benefits is precisely what makes SaaS business models so vulnerable. The ease with which your users can cancel means that the balance between acquisition costs, and lifetime value are vitally important. For a SaaS startup, creating stickiness, and increasing switching costs is key, so that customers are retained for longer. However, this is not the switching costs of old, where long term contracts and complex applications which needed significant training investment (thus increasing lock in) were to the fore. Modern switching costs mean delivering significant real value, encouraging daily active usage, and ongoing user satisfaction so the user has no reason to churn. If use of an application can become habitual, the switching costs compound over time, particularly if the application links to complementary solutions via open API’s. For example, Squarespace allows customers to build and run websites on their platform, while also encouraging users to integrate everything from hosting, to email to Google analytics. The value proposition is very strong, and once live the thought of switching simply does not enter the equation. Many SaaS applications suffer from the ‘empty state’ or ‘blank slate’ problem whereby initial experiences are underwhelming due to the fact that the application lacks meaningful data at the start e.g. an accounting software application with no financial data is pretty limited in use. Similarly, ensuring that the ‘time to utility’ is as small as possible helps ensure that the initial use experience delivers some early value, so the customer is incentivised to stick around. Engineering a successful onboarding, initial roll out or deployment is thus paramount. Obsessing over the various customer journeys will help ensure that initial client experiences are designed to provide some early value. Searching for patterns amongst successful users is important (be it via the likes of Intercom data or from conversations with real customers). If a certain cohort of active users followed a particular onboarding flow, then it is worth encouraging others to take the same path. For example, Facebook have recognised the importance of certain activities in the first few days of signup and actively encourage users to take actions that will increase their propensity to use the application. “The onboarding period is, for a business, perhaps the most critical time in a SaaS customer’s life.” Alex Turnbull, CEO of Groove. What are the key activities / tasks that need to be completed to obtain initial value? What incentives are in place to ensure the user takes these steps? How much (session) time is typically needed to obtain initial value/ to onboard successfully? What does the return profile of successful users look like i.e. do they return the following day/ week? One of the most common causes of churn for those with a large SMB and entrepreneur customer base is involuntary churn i.e. when your billing engine fails to successfully take a payment. This is more common with monthly subscription payments, and the causes will range from business failures, to payment dates of cards simply lapsing. Ensuring you have robust processes in place to spot bank cards approaching their expiry dates, and a communications flow that is automatically triggered to rectify the problem is important. Applications like Card Updater, Churn Buster and Visa Updater are particularly useful if your business volumes are sufficiently high to warrant a 3rd party intervention. Similarly some businesses incentivise the addition of secondary payment cards to your account, which can then be charged if the default one fails. Regardless of the approach taken it needs to be as frictionless as is possible, after-all updating payment details is a chore most time pressed users would happily avoid. While it may be tempting to make it difficult to cancel, this approach is not advisable as it runs the risk of generating support calls from irate customers who are used to ‘one click’ solutions. Phone to cancel? You must be joking! Encourage customers to remain subscribed to the newsletter (perhaps their ongoing patronage is contingent on a planned feature). In the early days it is vital that you speak to as many cancelled customers as is possible. The purpose of the call should solely be to learn about their experiences with a view to eliminating some of the causes that may impact others, rather than to try and pressurize them to stay. While not scalable, these early conversations are again vital to help ensure product-market fit and to surface key churn drivers that can be improved. The old adage that ‘prevention is better than cure’ is very relevant when it comes to SaaS. Using applications like Intercom and Totango it is possible to use data to spot signs of impending churn. For example, daily active use rates may taper off, or a key part of the success journey may remain unfulfilled e.g. perhaps a desktop install, or a data import has not been actioned in the first week when these are critical tasks to obtain value. Utilizing drip mailing campaigns and push messaging designed to encourage activities that increase the likelihood of a customer being retained are excellent ways to intervene before it is too late. If a certain action needs to be done before the user sees the value, this needs to be front and center of any flow. For example, Twitter incentivised new users to quickly and easily follow over 10 relevant accounts (based on signup signals incl location) recognising that this step was a key element of those who stuck around. Pre populating Twitter feeds with some relevant accounts made it a lot easier for initial users to appreciate the value. While annual licences are typical with enterprise solutions, they are not as common with consumer focused solutions. Offering enticing discounts for those who pay annually (and upfront) not only helps reduce churn, but can also dramatically improve your cash position. With a monthly commitment, the opportunity to churn is obviously increased eleven fold. Again this approach is not without some drawbacks, not least eroded margins. For monthly subscriptions saving invoices in a dashboard rather than emailing them out is also recommended for early stage SaaS businesses, who have yet to reach product-market fit, and do not want monthly invoice emails triggering mass cancellations. Of course these techniques do not address the core churn issues at hand, and are merely ideas that can be used to reduce churn in the early days when every penny counts, and it is all about survival. The signup form is a key step in any on-boarding process, as it represents the access point into your application. For most, a friction-less sign up process is important to optimize conversions. Allowing users to sign up with just an email / password combination is about as friction-less as you can get, but will likely result in lots of anonymous emails in the guise of hedt302@aol.com. Trying to meaningfully engage with a user with this data as the only data point is nigh on impossible. At the other end of the spectrum, a signup form that insists on verified business emails, and credit card details before allowing users to access the software adds significant friction but helps ensure quality. With the former, you may get the volumes but will also get a mixed bag of prospects, many of whom are just ‘kicking the tyres’. Insisting on verifying a business mail (for enterprise solutions), alongside a name and number will suppress sign up volumes but will ensure that the signup is more committed, is ‘real’ and is easier to engage with. If a significant segment of your signups are anonymous AOL and Hotmail accounts, your ability to engage is much more limited and their propensity to churn will be higher. So what seems like a relatively innocuous decision about a sign up form can have profound implications for churn. If senior management incentivize marketing to focus exclusively on lead velocity then they will naturally optimize as friction-less a sign up path as possible. On the other hand, ensuring the focus is on ‘real prospects’ will typically mean reduced leads initially, but if the value proposition is clear, and incentives are aligned then better qualified prospects will enter the funnel. If all else fails, you can ignore the leaky bucket, and UI/UX problems you have and continue to acquire new customers at a greater rate than those heading out the door. While this approach may help maintain a sense that all is okay, it is merely kicking the problem down the road but can help buy you time as you look to solve retention problems in parallel. For early stage companies, churn problems are compounded by the fact that customer acquisition costs can be unsustainably high as marketers focus on paying to acquire leads to support growth demands. Anyone can buy attention, the real question is whether this attention is rewarded with a long term commitment. In summary, managing churn should be a key concern for everyone working in a SaaS business regardless of their title or department. SaaS businesses are pretty unique, and the line between success and failure is razor thin. Understanding the key drivers of churn, and seeking to mitigate against them should be everyone’s priority. For early stage SaaS businesses it means obsessing over the details, talking to as many churn customers as you can, and seeking to combine marginal gains across all elements of your proposition such that the churn rate is within an acceptable band. Ultimately you have to deliver customer success, however, for startups embarking on a voyage of discovery towards product-market fit, the above represent some ideas to help reduce the impact of churn in the early days.